Sorry, it's been ages since my last blog, but the past few months have been hectic with work and lots of Christmas sewing, and rather marred by a traumatic experience with a tooth abscess ( me), tonsilitis (Mr Stickytarts) and the death of our cat Amber. 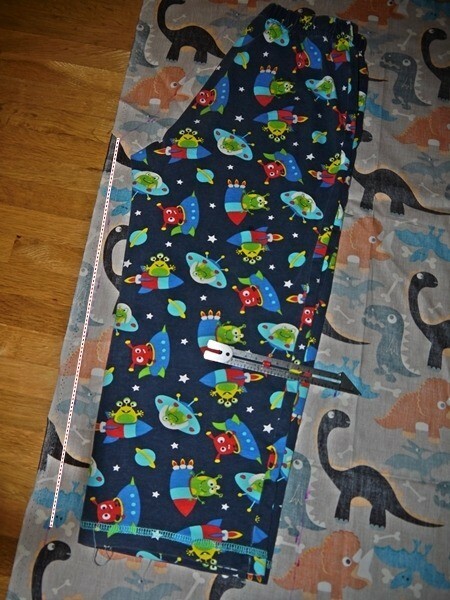 I have been sewing Pj/lounge pants for a while now - for myself, friends, my dad and Mr Stickytarts. They really are easy and once you get a hang of it can be completed in about 1 1/2 hours (yes really). No pattern is required and they can be made in any fabric that drapes well, ranging from flannels, to midweight cottons and even interior weight furnishing fabrics. The 3yr old LOVES PJs and if we let him would spend his life in them. 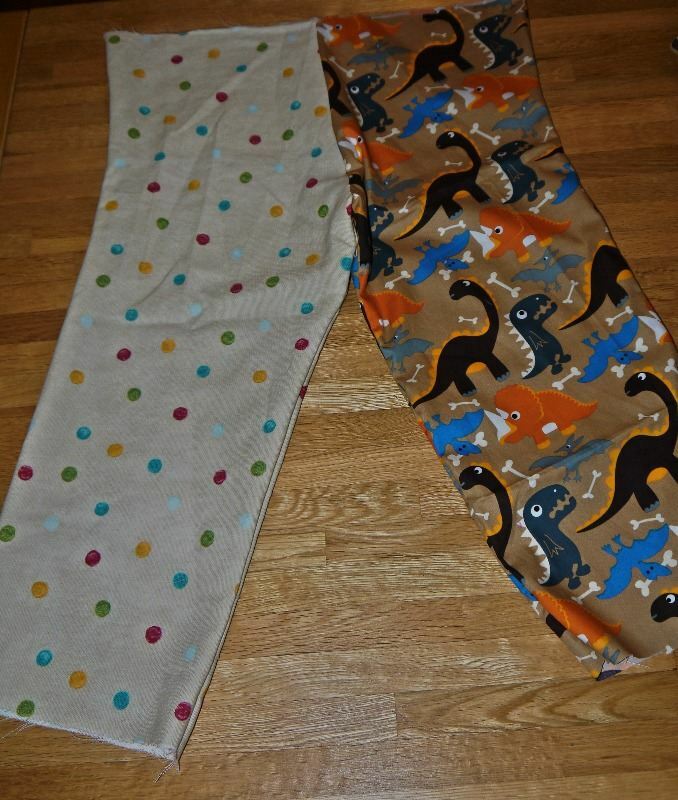 I have been meaning to make him a pair for ages, and yesterday whilst he was watching Monsters Inc. (93 minutes long, so perfect), I was rummaging through my fabric remnants and found two that I knew he would love. 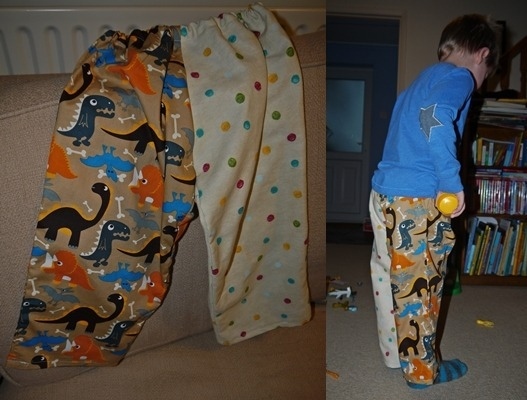 Neither was big enough to make a pair of PJ pants, but I had enough for one leg in each fabric - so these are the Mr Tumble/Dinosaur pants, and how to make your own PJ pants. Enough fabric to be able to draw around the pants FOUR times when folded in half, with a 1" seam allowance round the sides & 3" allowance top and bottom. 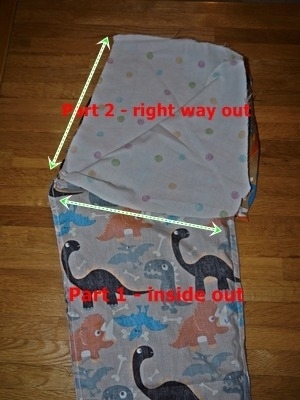 Fold the PJ pants in half & lay out on the wrong side of your fabric, ensuring you follow the direction of the fabric. 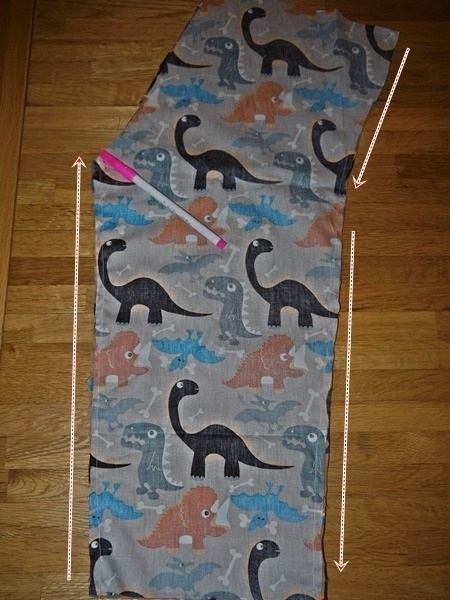 Sketch a line around the pants which is 1” from the sides, but 3” from the top and bottom. I have given an example of this on the left hand side of this picture. Remember to fully stretch out the waistband of the pants before sketching round it. This is easier with the help of another person. Use part A as a template and cut out another part (B) in the same way. Now flip over piece A and cut out 2 more parts (C & D). 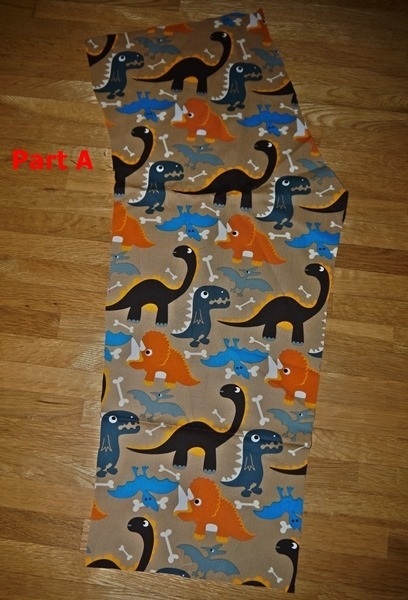 With right sides together, sew together the long straight sides of parts A & C with a ½” seam allowance. This is now part 1. Sew together the other side, but ONLY up to were the crotch curve starts ( I have marked this with a fabric marker on the picture). Repeat above steps with parts B&D. This is now part 2. Zig zag stitch all round the seams you have just sewn together to stop the fabric from fraying. Turn part 2 right side out. Tuck part 2 into part 1 so right sides are facing. Sew together the two seams marked with arrows. Zig zag stitch the seams you have just sewn. THE HARDEST PART IS NOW DONE. Round up the intended recipient. Hopefully you will find this easier than I did, as my 3yr old kept shouting “Too big, too big” and running away. Get recipient to put on pants. Measure where the waist should be. It should be 3” from the top as this is the extra you added to the original pants. However, this is where you can make fine adjustments if you want and alter the height of the waist. Make casing in same way as the hemming stage ( see picture below). Each turn should be 1”, BUT if you have decided on a different measurement earlier, simply divide this by three and that gives you the correct measurement. Secure casing by sewing it to the pant about ¼” from the bottom of the turn. Make sure you don’t go all the way round and leave 2” unsewn as this is where you will insert elastic. Thread your bodkin with , or secure large safety pin on, the elastic. Feed through casing. Turn pants right way out. Adjust elastic until recipient feels there is a snug but not too tight fit, tie a knot. Now measure how much the legs need taking up. This should be 3”, but again you may make adjustments here. Mark 1” from the bottom of trouser leg ( or use your adjusted measurement as discussed above), make first turn on this line. Press into place. Turn over again. Press. 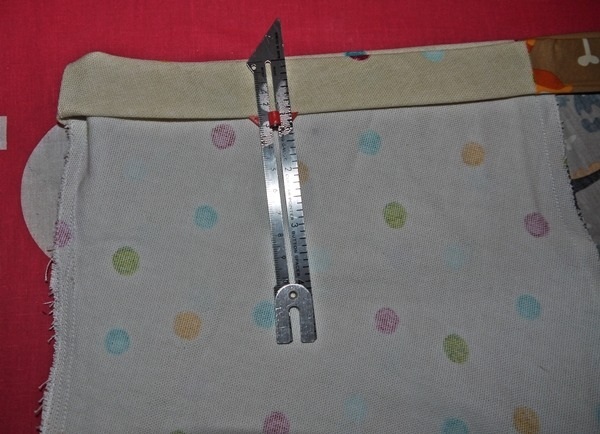 Secure hem to trouser leg, by sewing a seam about ¼” down from the top of the hem. Go round all the seams and snip off any stray threads with the embroidery scissors. Recapture recipient to prove to him/her how marvellous the fit is - even if they frantically try and get away from you and refuse to have their picture taken. 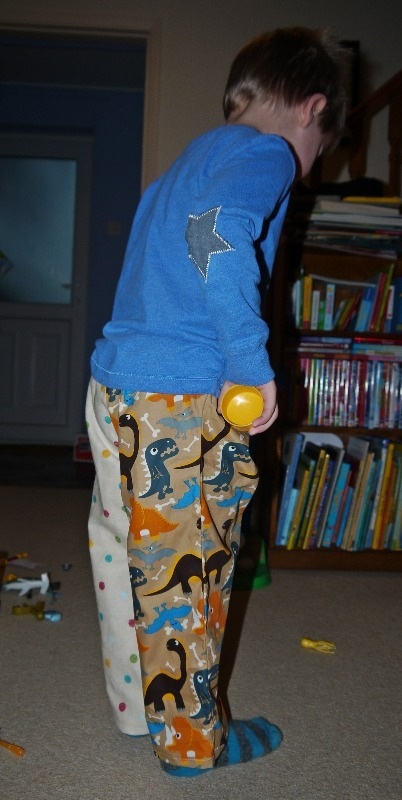 There is just enough time before Christmas to make one or two of these PJ pants before the big day - so I hope you find this tutorial useful. Please remember, especially when making these for children, that some materials are flammable ( e.g. the cotton I have used here ) and as such care must be taken with open flames or sources of ignition. Please do not reproduce this tutorial or parts of it in any way. Instead, if you would like to refer to it, please link to this page. Thank you. Here is wishing you a happy and peaceful Christmas !